We had a fight. For some reason the good and beautiful things in our marriage are not in the forefront of our marriage. I don't mean to ignore the not so happy things about each other that tend to rub us raw, I mean it is important to look at everything about a person and this is especially true in a marriage. No one is perfect and will never be perfect but if a person continues to look only at the flaws, even a diamond will not glisten, a great painting will loose its depth, and nature will have no life. Overly positive people will eventually come to a point of resentment and despair when the perfection they want to see doesn't come to be. Overly pessimistic people will never see the beautiful life in a single leaf or feel the heat from a single, flickering candle in a dark room. Life a great symphony. It is a combination of those notes that soothe and those that agitate but when the music has become quiet, we are left feeling awestruck. I have for some reason been very, very, (one more time for effect), very irritable with my wife. It feels like something inside of me that I just can't stop. It is all quite silly really. I don't know why some of the little things she does pushes my buttons so horribly. What I have been doing in my marriage hasn't been working all that well so I need to make some changes and also peer into my past to see what it is that I am acting out from my parents' marriage that didn't work for them either. I will start by acknowledging the things that I like and love about my wife. 1. First of all she is her. There isn't another one like her anywhere. 2. I have never been able to talk with another person about the deep and philosophical things that we talk about with any other person, ever! 3. She has a great innocence within her. I love the way she talks to the birds and the bees and they seem to listen with such intent. 4. I love to see her smile. It matches her star like eyes. When she laughs it is easy to laugh with her. It really shows up when she is being goofy. 5. She isn't all wrapped up in the material world. Sure she loves her comforts but her comforts are a comfortable pair of pants, a cup of tea, a nice soft blanket, the hugs she can give to her children. 6. I love her body. She is womanly with shapely curves that support her well endowed breasts. I wish she felt as good about her body as I do. 7. I love her poetry. It is what we shared when we first met. I cried when I heard it. It is true genius wrapped up in glorious beauty. 8. When she is free of those people who like to put a bird in a cage, she is an angel. 9. I love to see her cook. I find it interesting that she searches out different recipes but even that is in an effort to be loving. This loving is at the core of who she really is. 10. I love her rage. I have seen it rise up against dark things and like a laser, pin point the perfect point to strike a blow, putting an end to the abuse. 11. She may be the only person that has taken the time to try to see who I really am. 12. I love her outdoor girl ways. I get a chuckle when I see her run over and pick up a bug, hold it in her hands, and stare the little bug in the eyes, ever so curious about it. She sees the world and all of its life as a kind of family. 13. I love going to chick flicks with her. It is a kind of romance for us. After that, sharing our traditional coffee leaves me with a sense of things having a structure to them. I love my wife, especially when she is really being herself. Hello, and thanks for this contribution. I respect your willingness to look at yourself, and to share this beautiful and tender love you have for your wife. Keep choosing, over and over, to see the goodness in her. The more you do it, the easier it will become, and the more the love will flow between the two of you. Also, try getting a mental picture of the irritable guy inside, thank him for his effort to help, and give him a place by your side. Keep him there, and don't let him back into the driver's seat. You're not destroying him or fighting with him, just putting him in his place. He's a confused protector, and he does not need to be in charge of how you treat your wife. You're a good man, and your good heart comes through when you focus on what you love in the world around you. 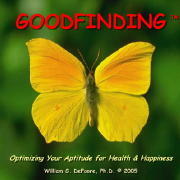 Keep the default "problem solver" part of your mind in check, and exercise the Goodfinder inside. You'll like it a lot better.